With prices for artificial chemical fertilisers at an all time high, a West Cornwall business has launched a new product for farmers and landscape gardeners to make cost savings whilst boosting their eco credentials. 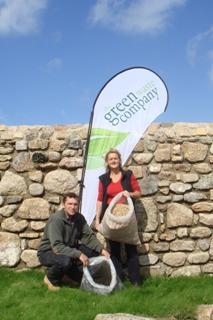 For the past eight years the Green Waste Company has converted waste wood into mulch and woodchip products and the green waste produced by households and horticultural businesses across the county into compost which has been previously restricted for use on their own land at Downs Farm, Splattenridden near Hayle. Now with an appropriate waste management licence in place, the company is able to pass on the benefits of their nutrient rich recycled product to individuals, businesses and organisations, keen to reduce their carbon footprint and use a locally made, natural and peat-free product. Being full or organic matter, the compost improves soil nutrient levels and structure, helping to reduce water run-off and the need for artificial fertilisers. With each delivery of compost the Green Waste Company are able to provide customers with details of the nutrient make-up of their specific batch to enable them to adjust their fertility plan accordingly. “We have been using the recycled green waste compost on our own farm for many years and have seen massive benefits.The compost is accredited by the Association for Organics and Recycling holding PAS100 certification verifying its high standard. We have discovered that the pH value and structure improving properties of the compost means that it’s particularly well suited for spreading on land for growing brassicas as it can help to prevent club root. “At a time when people are increasingly aware of their carbon footprint, using compost and mulch produced as a result of recycling wood and green waste that could otherwise have taken up precious landfill space is a great solution – Its good for the environment and for the business bottom line. The Green Waste Company processes 18,000 tonnes of green waste annually, a figure which has risen steadily over the past eight years and has recently necessitated additional investment in their site near Hayle including a new shredder and paved surfaces for the production of compost, which typically takes between three to six months. One Cornish farm already putting the Green Waste Company’s compost to the test is the organic farm and pack company W J Oliver & Son Ltd in Helston. Agronomist Ian Boase decided to trail the compost as part of his search to find economical but effective ways of fertilising the land at Goon Rinsey Farm whilst meeting the guidelines set by the Soil Association for operating an organic farm. Ian Boase said: “We incorporate fertility building into our rotation, but where situations exist that inputs are required, the Soil Association’s sourcing list is quite limited. Many of the fertiliser options, such as Gasfa and Sylvernite are expensive, so I’m always looking for opportunities to find alternative sources of fertility that will do a similar job whilst being more cost effective. “We have spread the Green Waste Company’s compost on 25 acres in March which will accommodate a range of crops produced for the multiple sector as well as the Organic box scheme that we operate. We will soon start seeing how successful it has been when we start cropping, but the initial results look promising. It is hoped the compost should maintain or slightly enhance levels of potassium and phosphorous, where applications are permitted, as both these nutrients are important to the crops we grow. Additional benefits from using the compost is its good neutralising value and depending on the grade utilised there should be an improvement in soil structure. “W J Oliver & Son is pleased to be able to support another thriving local business and to find a good cost effective alternative to the mineral fertilisers, which is produced here in Cornwall. Three grades of compost are available; Gold Spring – a top quality gardening grade compost, Harvest spring – an agricultural grade compost giving all crops a healthy start and Green Spring – the sports field application for well maintained grounds, giving the best care to your rugby, football and cricket pitches. Mulch is available in two sizes, ideal for low maintenance planting schemes. The exceptionally wet summer is seeing an increase in demand for the Green Waste Company’s product Mudaway; a recycled wood product with a high dry matter content to make muddy gateways usable in even the wettest conditions. Mudaway is also ideal for outdoor events such as weddings and was used at the Royal Cornwall Show and the recent Cornwall Young Farmers’ Club County Rally. Companies interested in receiving further information about the Green Waste Company’s compost products can find further information at www.greenwastecompany.com or can call 01736 752393 or 07968 113419.